Young people with disabilities are often isolated from their peers, but community members in Groton, MA frequently interact with residents at Seven Hills Pediatric Center. 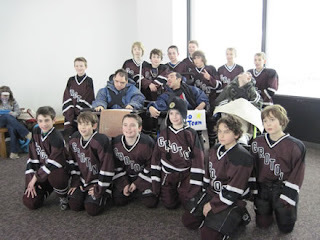 This winter players in the town middle school hockey league invited residents to attend a tournament held at The Groton School, a private college preparatory school in Groton. 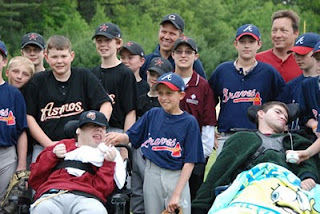 In the spring local kids hosted more residents at one of their Little League games. H.A.L.O. recently donated an adaptive tricycle to the Gavin Middle School in Boston at the request of Physical Therapist Susan Maltz, MPT. It adds variety to therapeutic treatment plans and keeps students motivated to exercise, and everyone thinks it’s pretty cool when students ride the Rifton Wrangler through the cafeteria . 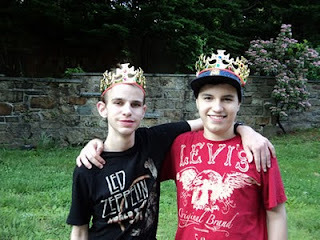 Gavin is a traditional public middle school which also hosts special needs programs that serve students with moderate to severe developmental disabilities. Some students require the use of wheelchairs, feeding tubes or other medical equipment. She said bike riding helps students increase muscle strength, joint motion, balance, and coordination, and improve movement and fine and gross developmental skills. The rectangular handlebars offer plenty of places to put hands; the low cross bar makes it is easy to mount; and the adjustable seat with higher back provides stable sitting. 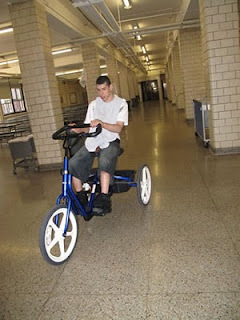 For information about Rifton adaptive tricycles visit http://www.rifton.com/ or call 800 571-8198. To make a request visit http://www.halofoundation.org/. Horror stories. That’s what parents of teens with brain injuries say about life before enrolling their children in the Ivy Street School. Anger, frustration and sometimes violence were everyday events. Families felt out of control, children were socially ostracized, and schools regularly kicked them out. There was no happy ending in sight. “Bridget was very angry about changes in her life but unable to deal with it because of her brain injury,” said one dad. “Stephanie had seven failed (school) placements, because they didn’t understand how to help her, ” her mom said. Ivy Street focuses on making life meaningful for the young victims of accident, stroke, tumors or genetic abnormalities, and helps them build bridges to adult life. There were no signs of tragedy when HALO visited the school on the day of the annual talent show. Laughing young people rushed to assemble costumes and warmly greeted returning alumni and visitors. Thirty students aged 13-22 live and attend school year round in a converted mansion in Brookline, a quiet Boston suburb. MAB (formerly Massachusetts Association for the Blind) founded the school in 1993 after medical advances improved survival rates for individuals with brain injuries. Ivy Street tailors academic plans to each student’s education level and vocational interests. All students start with a job in the school, then advance to volunteer work and then compensated employment in the community. “Work gives them so much . . . It provides structure, increases confidence and gives them hope. 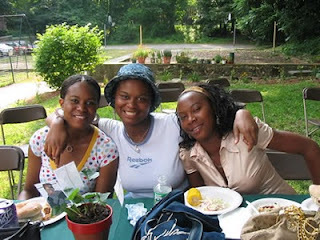 We try to help them build bridges to their future,” said Barbara. Recent graduate Stephanie Leonard, 22, says Ivy Street helped her find her voice. She writes a blog for a local newspaper, was recently published in the inaugural edition of Our USA Magazine and has been accepted at a community college. For more information visit http://www.mabcommunity.org/. Kids who have conditions like muscular dystrophy, congenital myopathy, spinal muscular atrophy and mitochondrial disease can’t make their muscles work predictably, so they miss out on a lot of fun. Plus, they have to make frequent visits to the doctor and hospital. In 2009 H.A.L.O. teamed up with the Pediatric Neuromuscular Clinic at MassGeneral Hospital for Children in Boston to help 30 of about 300 regular patients feel a little bit better about coming to hospital appointments. The clinical team consulted with patients’ families, then purchased gifts from their personal wish lists. They presented the gifts as a surprise, usually at the patient’s next appointment. “It was pretty special for the kids,” said Laurie Bliss, clinic coordinator, who, along with medical students Kelly Dominick, Kristen Lundgren and Jamie Brown identified the patients who could benefit from attention. Gifts included books, Legos®, blocks, Hannah Montana® videos and things like movie gift certificates for older children. Recipients were 4 to18 years old. Dr. Brian Tseng, MD, PhD and Director of Pediatric Neuromuscular Service at MassGeneral Hospital for Children, said the gift program dramatically enhanced the lives of the patients, because it came “out of the blue” and demonstrated that someone cared about their daily struggles.